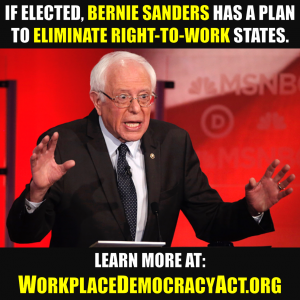 Unions have never represented a majority of the American workforce. However, to listen to today’s union bosses, one might be led to believe that they did. Ever since their peak, in 1945, when unions represented a total of 35.5 percent of the workforce unions in the private-sector have been on an almost steady decline. The common fallacy is that the union decline is due to the Reagan Era. That, however, is a false narrative. On December 27, 2010, Alfred E. Kahn died. He was 93 years old. You might not know who Alfred Kahn was, but if you are an air traveler or work in the airline industry, you have been affected by his work. In fact, most likely, the vast majority of Americans have benefited by Kahn’s work without knowing who to thank. Alfred Kahn was a Cornell University economist and, according to the New York Times, “best known as the chief architect and promoter of deregulating the nation’s airlines.” More importantly, Alfred E. Kahn worked for President Jimmy Carter. Kahn’s work in deregulating the airline industry during the Carter administration was an economic boon to tens of millions of middle-class Americans who, due to lower costs, were suddenly able to travel by air, rather than by car, rail or bus. Deregulation also lowered the costs for companies, as the increasing competition made business travel more affordable. By largely getting rid of bureaucratic inefficiencies and increasing competition, according to a Heritage Foundation study, prices fell 40% for travelers within the first 20 years of airline deregulation giving more and more of the American public the ability to fly affordably. Airline routes, instead of taking up to eight years to be approved (or disallowed altogether) under the old Civil Aeronautics Board were established much more quickly; and, perhaps most importantly, under deregulation, air travel became safer. However beneficial Kahn’s work has been to the American flying public, it is only one of several keys to unlocking one of the biggest fallacies ever foisted on the American public. That fallacy is that the policies of Ronald Reagan are the primary cause of the fall of private-sector unions. The fact of the matter is, they are not. Reagan’s policies are not what has busted unions over the last 30 years. In fact, it is the work of Democrat Jimmy Carter and his deregulators that has had a far more detrimental impact on unions than Reagan ever did. 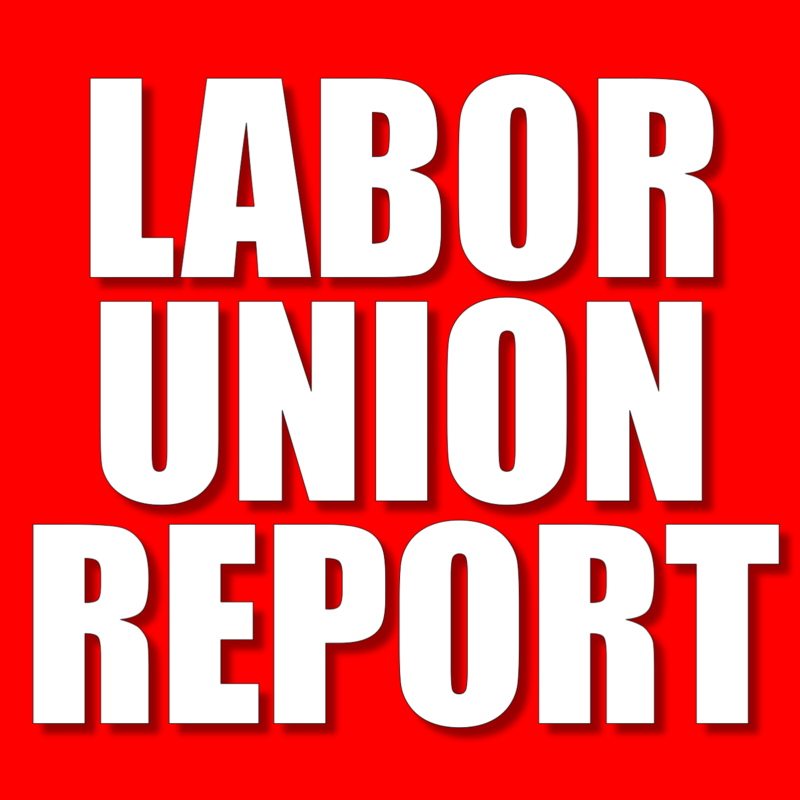 In addition, it is also why, regardless of the efforts of union bosses and their Democrat stooges in Washington, despite a potential temporary upswing, no amount tinkering with the National Labor Relations Act will enable private-sector unions to regain their footing in a 21st Century economy. Union bosses, Democrats and their sycophantic followers on the Left have been allowed to rewrite history for 30 years. Despite evidence to the contrary, they have largely cast blame for the fall of unions on “The Reagan Era,” blaming Ronald Reagan (and, later, his Republican successors) for the massive decline in unionization. Sadly, for those of us in the union movement during the 80s and early 90s we, like Pavlov’s dogs, believed The Big Lie—unfortunately, many still do today—that Reagan and Republicans are the cause of the union movement’s demise. The fact of the matter is, by the time Ronald Reagan was sworn into office the die had already been cast: Private-sector union membership in the United States had already begun its free fall, aided by market forces and the deregulatory push that the Carter administration put in place. The simplistic view of Ronald Reagan, the union-buster, stems from the 1981 PATCO strike and the “wide-spread union-busting” that followed in the private-sector. 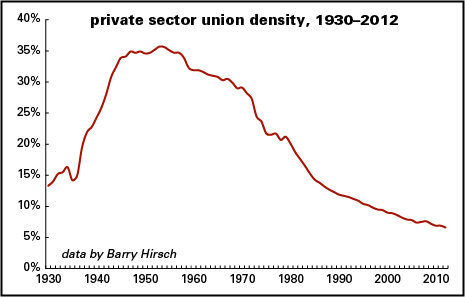 The problem with the anti-Reagan meme is that it completely ignores broader, more structural and consequential factors that led to the decline of unions. While Ronald Reagan did fire more than 11,000 air traffic controllers when they engaged in (as federal workers) an illegal strike less than a year after taking office, the strike contingency plan Reagan deployed had already been developed under Carter. The Federal Aviation Administration (FAA) under Carter conducted a management campaign of harassment against union controllers. And 12 months before the government’s contract with PATCO was set to expire, Carter formed a “Management Strike Contingency Force” to prepare for a walkout–including the use of scabs. According to the Left’s narrative, it was the PATCO strike, the replacing of strikers in the private-sector during the 1980s, combined with the Reagan-appointed National Labor Relations Board that has caused the decline of unions. However, this view is as misleading as it is simplistic. Before Ronald Reagan stepped into the Oval Office, the American economy had suffered nearly a decade of economic malaise. By June of 1980, the “misery index” had reached an all-time high and the Carter Economy had become an issue of the presidential campaign. By the time November 1980 rolled around, Carter’s stagflation had become a household word and Ronald Reagan became President. However, this did not happen before President Carter had set into motion the most fundamental shift in America’s regulatory environment that caused the most remarkable decline in union power since the 1947 passage of the Taft-Hartley Amendments to the National Labor Relations Act. Due, in part, to the Great Steel Strike of 1959 (which opened the door to foreign competition), the American steel industry had already begun to decline by the time Carter was in the White House. However, by the 1970s and early 80s, more and more industries were beginning to feel the effects of the global marketplace, with Japan and Germany becoming ever-larger competitors. Foreign competition, in turn, was beginning to bring greater economic pressure to bear on U.S. companies which caused them to begin re-evaluating the old labor-relations models. The increased economic pressure caused companies to begin taking a harder line in negotiating union contracts with unions across the country and, in cases where unions struck, companies began to use with more frequency a tool that had been available since the 1930s, the right to permanently replace economic strikers. When Ronald Reagan appointed members to the National Labor Relations Board, his appointments and their subsequent decisions were frequently blasted as being “anti-union.” Notwithstanding the argument that many of the NLRB’s decisions under the Reagan Board were more favorable to employers than any since the Eisenhower Board, even the totality of the Reagan Board’s decisions could not have had the negative outcomes that were set in motion by Carter. In addition to deregulating the airline industry earlier in his Presidency, in 1980, two laws were signed by Carter that greatly transformed the rail and trucking industries. The first was the Staggers Rail Act and the other was the Motor Carrier Act. By largely deregulating both the rail and trucking industries, these two laws have significantly altered the landscape for transportation unions. For the most part, Carter’s prediction has come to pass, as railroads were able to finally able to set their own prices and dump unprofitable lines. 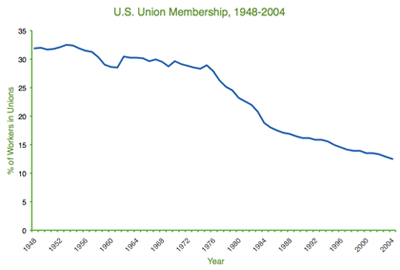 However, with deregulation has come a loss of union membership as the industry changed over the last 30 years. The International Brotherhood of Teamsters, one of three unions who endorsed Reagan, pretty much controlled the interstate trucking industry in the U.S. prior to 1980. Before Carter signed the Motor Carrier Act of 1980 into law, price-fixing and regulated routes was as much as 75% higher than unregulated freight. Both the Teamsters Union and the American Trucking Associations strongly opposed deregulation and successfully headed off efforts to eliminate all economic controls. Supporting deregulation was a coalition of shippers, consumer advocates including Ralph Nader, and liberals such as Senator Edward Kennedy. Unable to stop Carter’s deregulatory move, the Teamsters saw their near-monopoly in the industry end. Deregulation has also made it easier for nonunion workers to get jobs in the trucking industry. This new competition has sharply eroded the strength of the drivers’ union, the International Brotherhood of Teamsters. Before deregulation ICC-regulated truckers paid unionized workers about 50 percent more than comparable workers in other industries. Although unionized drivers still are paid a premium, by 1985 unionized workers were only 28 percent of the trucking work force, down from around 60 percent in the late seventies. Prior to deregulation, the Teamsters had 2.2 million members. However, as unionized trucking companies closed due to competition, the Teamsters’ union continued to lose members. Today, the union represents a mere 1.4 million and, were it not for union mergers and branching out into other industries, it would be considerably less than that. 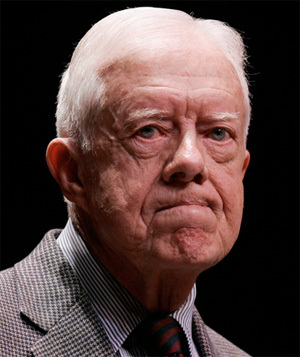 In 1982, after President Carter had left office, an eight-year old anti-trust case against AT&T resulted in a settlement. The settlement called for the monolithic telephone company to divest itself of its local exchange companies. On January 1, 1984, AT&T’s seven Regional Bell Operating Companies (RBOCs) were severed from Ma Bell. The Ma Bell breakup led to the downsizing of hundreds of thousands of union members, primarily members of the Communications Workers of America (CWA) and the International Brotherhood of Electrical Workers (IBEW) that continues to this day. In one year alone (from 1985 to 1986), CWA lost 53,000 members, as competitors like MCI and Sprint gained greater market share. The judge who presided over the break up of Ma Bell was Judge Harold Greene. He was a Jimmy Carter appointee. Despite the myth that Reagan is the one that devastated private-sector unions, no amount of so-called “union-busting” that Reagan allegedly did matches the amount of devastation that President Jimmy Carter did to unions by crushing their monopolies in the Air, Rail Telephone and Trucking industries. Though the narrative is a convenient one, it is misleading. I have to concede that the competition that deregulation brought certainly was terribly, terribly hard on the airlines and their unions, who had heretofore enjoyed the benefits of protection from competition under regulation. It is time to set the record straight and give Carter credit where credit is due: Jimmy Carter was the nation’s biggest union-busting president in the 20th century. This post was originally posted on RedState.com and BigGovernment.com. According to heritage foundation… I stopped reading. Heritage is funded/founded by the Koch brothers, yes the same koch brothers that bussed tea party goons into Wisconsin to protest against workers rights. That wouldn’t be anything like the OFA who bussed union goons into Wisconsin, right? And unions don’t fund the EPI or ARAW? Nothing like the hypocrisy of the Left. To be sure, Csrter’s deregulation of major industries did contribute significantly to the decline of organized labor. Still, its flat out foolish to ignore Reagan’s role given the fact that illegal firings were at an all time high during his administration.